More often that not, croutons are an almost forgotten addition to salads and soups. They tend to be pretty flavorless and have a texture that can be, let’s say, a little too crunchy. Who says that croutons can’t be refined? My Salt & Pepper Puff Pastry Croutons are the perfect way to elevate any salad. You can either toss them in, or even serve on the side (in a beautiful basket) as an especially chic bread course! Believe me, they are so delicious, you might not have any left to make it to the table for your guests! Speaking of guests, these croutons make a fabulous canapé (just sprinkle them with Parmesan or Gruyère) to serve with drinks as your guests arrive. If you are new to baking with puff pastry, one thing to keep in mind is to work quickly. The pastry will become more difficult to handle as it warms up. These can be made in any shape you like, so if you have any fun cookie cutters on hand, get as creative as you want! Preheat the oven to 425 degrees F. Line a sheet pan with parchment paper. Set aside. In a small bowl, beat 1 egg with 1 tablespoon of water. Place 1 sheet of thawed puff pastry onto a lightly floured surface. Brush with the beaten egg. Sprinkle evenly with 1 teaspoon of Fleur de Sel and 1 teaspoon of freshly cracked black pepper. Using a cutter of your choice, cut the sheet of pastry into shapes. Transfer each piece of pastry to the prepared baking sheet. Bake for 10 - 15 minutes, or until puffed and golden brown. Tip: You can make these croutons up to two days in advance and store in a sealed container. Simply reheat on a baking sheet in a 350 degrees F oven for 5 - 10 minutes and you will have perfectly crisp puff pastry croutons! No doubt you have spent many evenings enjoying an Aperol Spritz al fresco (or at your favorite hotel bar!). I know I have! But have you ever considered Aperol as the star of a martini? 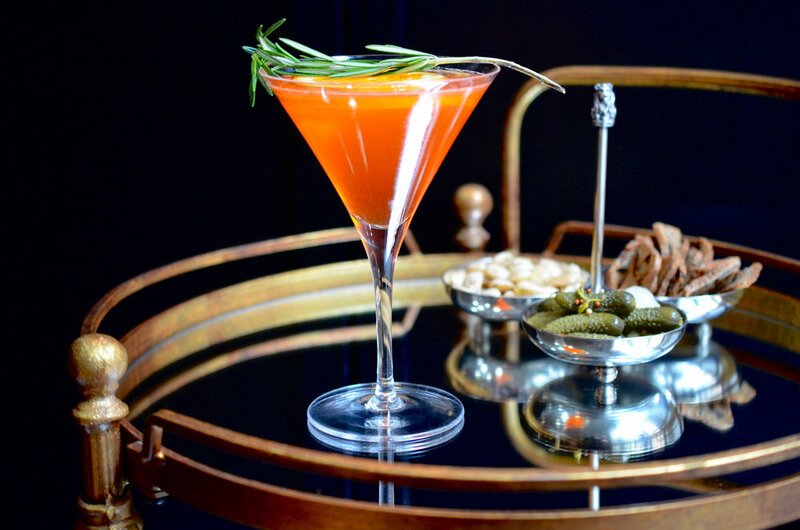 My G&A Martini brings together the bright, citrus flavor of Aperol, the herbaceous layers of The Botanist gin and with the wonderful fizz of champagne to make for a refreshingly chic take on the most classic of cocktails. If you are looking for something new to greet your guests with at your next party, you can serve the G&A Martini alongside my Puff Pastry Pinwheels sprinkled with a bit of Gruyère cheese. For a larger crowd, take a page from the European entertaining playbook and present each drink over ice in small bistro glasses! Cheers! In a tall pitcher, stir together the gin, Aperol, triple sec and orange juice. Set aside. Fill a large cocktail shaker half full with ice. Pour enough of the drink mixture into the shaker to almost fill it. Shake the cocktail for a full 30 seconds and strain into martini glasses. Top each martini with 4 ounces of chilled champagne. 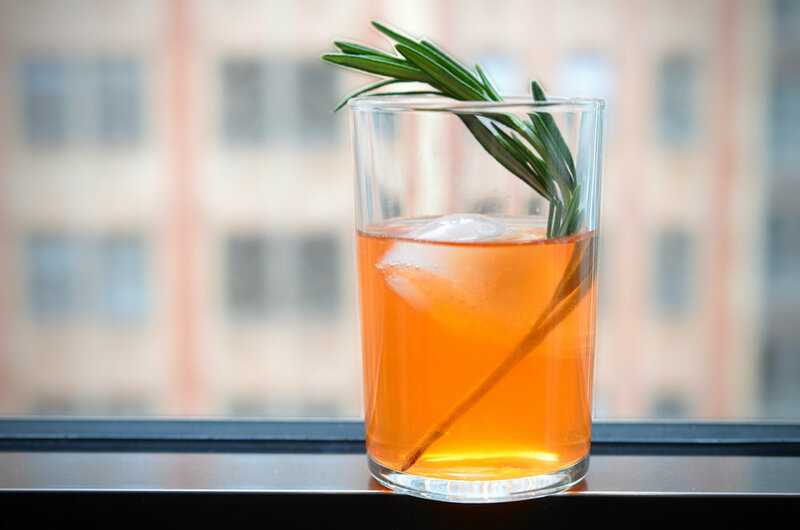 Garnish each glass with a sprig of rosemary and fresh orange slice. Serve cold. If you’re like me, you get to a point when you just need a moment during the winter months where you can just sit back and feel cozy. I love bundling up and watching snow fall (especially at the beach! ), but sometimes, I need a little escape from the cold. I decided that now would be the perfect time for a luxe, chocolaty pick-me-up to relax and recharge. My Cognac Hot Chocolate is a rich, layered and complex version of traditional hot chocolate, but with a little kick, courtesy of the addition of cognac. Far from the hot chocolate of your childhood, this treat is sophisticated and worthy of a few quiet moments to sit, enjoy and stay warm indoors. Cheers! In a large saucepan set over medium heat, add the milk and half-and-half. Heat to just below the simmering point. Remove the pan from the heat and add all of the remaining ingredients, except the cinnamon sticks. Using a whisk, vigorously whisk the mixture until it is smooth and the chocolate is completely melted. Gently reheat over medium heat, ladle into mugs and garnish with a cinnamon stick, a bit of frothed milk or whipped cream (if desired). Tip: You can prepare the hot chocolate up to five days in advance and store it in an airtight container with a piece of plastic wrap pressed against the top of the hot chocolate and set in the refrigerator. The plastic wrap will help prevent a skin from forming on the top of the hot chocolate. Baking with frozen puff pastry doesn’t have to be intimidating! By working carefully, you can make the most of every delicious, flaky layer of this delicate but satisfying freezer staple. My elegant Buttery Pinwheels, crisp and fresh from the oven, can be served at breakfast with jam, at lunch with fresh fruit and a green salad, or at dinner with salted butter. They are also perfect to make ahead for entertaining a crowd! Just assemble, refrigerate and bake right before your guests arrive. Or you can even bake them ahead of time, store them for up to two days in an air-tight container and re-crisp them on a sheet pan lined with parchment paper in a 350 degree oven for 5 minutes – et voila! Watch my video below as I show you step by step how to make these beautiful pinwheels yourself. It’s easier than you think! In a small bowl, beat 1 egg with 1 tablespoon of water and set aside. Place 1 sheet of thawed puff pastry onto the baking sheet. Cut the pastry into 4 individual squares. For each square, use a paring knife to cut from each corner toward the center, stopping 1-inch from the center. You will have a 1-inch circle in the center of each square, and all of the corners will be cut in half. To create each pinwheel, lift one half of a corner and fold the point toward the center of the square. Continuing around the square, fold each of the three remaining corner points toward the center of the square, and gently press all 4 points together to form a pinwheel shape. Brush the dough with the beaten egg. Bake for 16 – 18 minutes, until the pinwheels are puffed and golden brown. 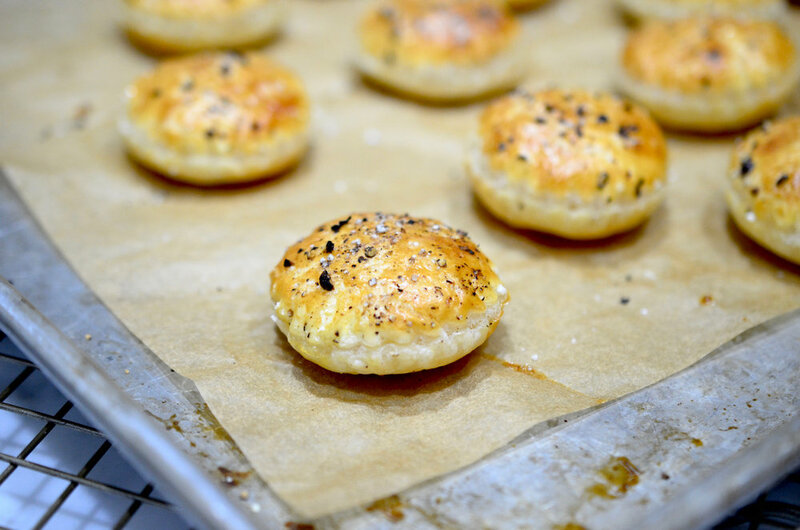 Tip: Before baking, you can sprinkle a bit of Parmesan or Gruyere cheese onto each pinwheel and serve these with a glass of wine or champagne as a fabulous hors d’oeuvre! Back in the 1970’s fondue was all the rage, with bubbling fondue pots being the star at many a chic get-together around the country. While no longer the fad du jour it used to be, I happen to think that an old-fashioned, cozy fondue party is a fabulous way to gather with friends in the middle of a long, cold winter! My fondue is simple to make; you don’t need any special equipment- just a heavy-bottomed, heat-proof pan that you can set over a small candle or a sterno can. Fondue is traditionally served with a crusty bread, but I also love to pair it with a medley of perfectly roasted potatoes. Did you also know that you can prepare fondue in advance? You can store it in the refrigerator in an airtight container for up to three days and reheat in a pan with a few splashes of white wine or heavy cream just before serving. This dish is comfort food and a soirée starter all in one. Add a bottle (or two) of a bold red wine, a big green salad with my French Bistro Vinaigrette, really fun friends and you’re all set! In a large bowl, combine both cheeses and the flour and toss to coat. Set aside. Next, in a medium heavy-bottomed pot set over medium heat, add the butter. Once hot add the shallots and thyme and cook for 3-5 minutes stirring occasionally until the shallots are translucent. Add the garlic, nutmeg, salt, and pepper, and cook for 60 seconds, being careful not to burn the garlic. Pour in the wine and allow it to come to a boil. Finally, add the cheese mixture in small handfuls and whisk briskly until smooth before adding in more cheese. Repeat this step until all of the cheese has been added. 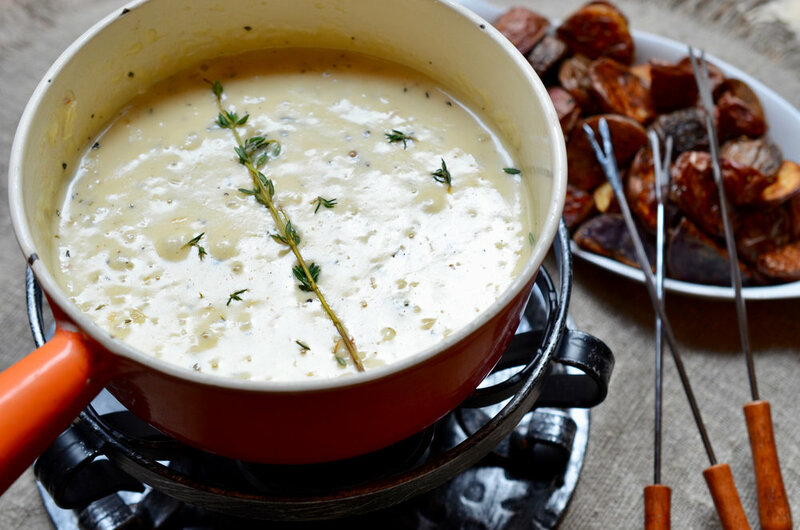 Transfer the fondue to a heat-proof pan set over a candle or sterno can to keep warm and serve immediately. If the fondue gets a little thick as it sits, add a splash of wine. Make sure to measure the cheese after cutting away the rind for the most accurate measurement. I like to garnish the fondue with a sprig of fresh thyme and a few of the leaves for a simple, but beautiful presentation. While a certain show made the “Cosmo” the libation of the early 2000s, it should be in everyone’s repertoire as a classic cocktail perfect for any celebration. I amped up the festive factor with a delicious rim of confectioner’s sugar that adds a layer of delicate sweetness. Not only is it easy to make at home (everything goes into a shaker! ), it requires just a few simple but really good ingredients. Check out my video below to watch me re-create this iconic cocktail and hear the hilarious story of how it got its name! Pour the confectioner’s sugar onto a small plate. On another small plate, pour just enough lime juice to coat the bottom of the plate. Place the rim of a martini glass into the lime juice then directly into the confectioner’s sugar, gently rolling it to cover the rim. Place the coated rim onto a piece of parchment paper and allow dry for 20 minutes. Next, fill a shaker with ice and add the lime juice, Triple Sec, vodka, and cranberry juice. Strain the cocktail into the prepared martini glass and serve immediately. Idea: I love making big batches of these for a party! You can rim glasses up to 3 hours in advance and allow to dry. Fill a glass pitcher with the cocktail ingredients and let it sit in the refrigerator. Then when a guest needs a cocktail, simply fill a shaker with ice, fill the shaker, shake, and serve. Making cocktails at home has never been so easy! Recently I returned to the WGN Studios in Chicago for a SPOOKtactuar segment on creating a tablescape perfect for a Halloween soirée! Don’t let the word “tablescape” scare you, it is easy to re-create this over-the-top look at home with just a quick trip to your grocery store and a few clicks online. Even my Pumpkin Cupcakes with Cream Cheese Frosting and my Orange Creamsicle Martini use basic everyday ingredients, but have a WOW! factor. Here are more BOOtiful Halloween ideas and below I’ve included the clip to my Halloween segment on WGN. There is also a fabulous contest on my homepage - happy trick or treating! A few weeks ago I mentioned I had been in the kitchen testing guacamole recipes and I just had to share my Pomegranate Guacamole recipe with you (how could I keep this from you?)! This classic recipe with a MJS twist is bursting with fresh basil, red onion, and juicy pomegranate seeds. I love serving this dip on a long rectangular platter with pomegranate seeds casually strewn over the top. Not only is it delicious, but I love the drama of the contrasting colors! In a large bowl, add the freshly-squeezed lime juice and avocados. Using two sharp knives in a crisscross action, slice through the avocados in the bowl until they are finely diced but still have some texture. Add the red onion, basil, salt, and pepper, and gently toss. Lastly, garnish with pomegranate seeds. I don’t know about you, but I have been eating guacamole all summer long! The past few months I have been testing guacamole recipes with different ingredients, flavors, and textures to give this classic dip an MJS twist. My Green Apple Guacamole is filled with crunchy green apples, spicy green onion, and of course creamy Hass avocados. As it turns out, green apples not only add fabulous crunch, but also a little bit of tartness that really cuts through the richness of the avocados. A classic, updated - enjoy! Lastly, add the remaining ingredients and gently toss. During the winter, when the temperatures are just freezing, is actually my favorite time of year to entertain at home. People tend to stay a bit longer, the food is very comforting and hearty, and everyone can relax and have a really good time! 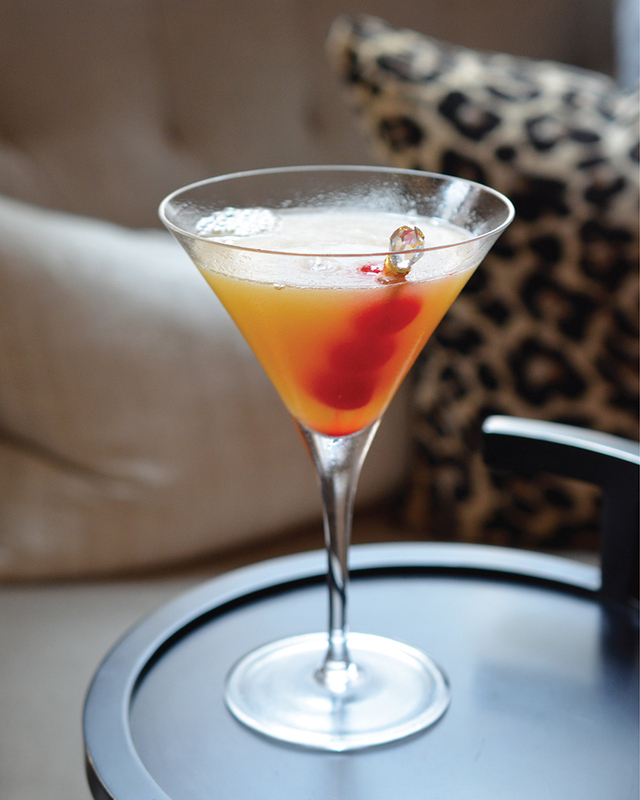 When my guests arrive, I offer them a hot cocktail to warm them up and make them feel right at home – and it gives me time to put the finishing touches on dinner. My Cointreau Winter Cider is filled with aromatic spices, lime juice to cut the sweetness, and has an orange boozy kick from Cointreau (that is sure to warm you up!)! Best of all it can be made in advance so there is no mixing or shaking individual drinks – which leaves more time for me to enjoy the soirée, too! In a large saucepan set over medium heat, add all of the ingredients except for the Cointreau. Bring to a boil, remove from the heat, add the Cointreau, cover and steep for 20 minutes. Fill heat-proof glasses or mugs with hot cider, garnish with extra cinnamon sticks, and serve. Tip: If you would like to make this in advance, after the cider is finished steeping, remove the fruit and spices, and store the finished cider in an airtight container in the refrigerator for up to 2 days. When you are ready to serve, gently re-heat the cider in a medium sauce pan over medium heat and serve hot. Whenever I travel I like to bring home food and entertaining inspiration from some of the world’s most extraordinary stores. When I was in Berlin in early December, I was shopping in the candy department at KaDeWe (it is an entire floor!) and came across a beautiful bar of white chocolate with dehydrated strawberries. I snapped a photo and continued on. After getting over my jet-lag, I headed into my kitchen in Chicago and I recreated my version using white chocolate chips that are readily found in all grocery stores and freeze-dried strawberries from Trader Joe's. After a few batches, the addition of vanilla bean seeds and French sea salt where the magic ingredients! The vanilla added depth of flavor to the chocolate and the salt took it from a sweet treat to an elegant homemade candy - a truly winning combination! Using a pencil, draw a 9x11-inch rectangle on a piece of parchment paper. Turn the parchment paper over and place it onto a half sheet pan. Set aside. Add three quarters of the white chocolate chips to a heat-proof glass bowl. Place the bowl in the microwave and heat on high for exactly 30 seconds. Using a rubber spatula, stir the chocolate, return it to the microwave, and heat on high for another 30 seconds. Continue to heat and stir in 30-second intervals until the chocolate is just melted. Once it is just melted, add the remaining chocolate chips and vanilla bean seeds and stir until it's completely smooth. Pour the warm melted chocolate onto the parchment paper and spread it lightly to fill the drawn rectangle on the prepared sheet of parchment. Next, while the chocolate is still warm, evenly sprinkle over the fleur de sel. Arrange the freeze dried strawberry slices to fill the entire chocolate surface. Allow to sit at room temperature for 3 hours to set. Break into pieces are serve. Tip: In addition to the whole slices of strawberries, I also use the “strawberry dust” at the bottom of the bag. It adds even more flavor to each bite of chocolate bark and also looks fabulous! My Warm Winter Glühwein - Inspired by a recent trip to Berlin, Germany for a grand tour of the Christmas markets! Napkins: Britten Couture Home. Cup & Saucer: Cassandra's Kitchen. In early December I had the pleasure of traveling to Berlin, Germany with my dear friend Jennifer to celebrate her milestone birthday! Like me, she is a lover of all things Christmas, and the trip was on her bucket list of places to travel. The plan was to stay in the center of Berlin and spend a week visiting museums, restaurants, and of course the Weihnachtsmarkts (Christmas markets) that are situated all throughout Berlin! A favorite (and very stylish!) market was WeihnachtsZauber at the Gendarmenmarkt. This is one of the most popular Christmas markets in Berlin during the festive Christmas season. Framed by the Französischer Dom, the Konzerthaus, and the Deutscher Dom, a small tent city with more than 1,000 strings of light appears like magic each year in this centrally-located square that house artisans selling handmade ornaments, candles, gifts, and casual food stalls. Besides the many wintry delights at the market stalls, Michelin-starred chefs offer their haute cuisine in heated tents. This market was so enchanting, we went twice! All of the markets, bars, and restaurants offer different variations of warm Glühwein—based on either red or white wines (I like to use a Cotes du Rhone or Chardonnay) infused with dried spices, honey, and orange peel, which is served warm and typically with a shot of liqueur like amaretto, brandy, or dark rum. After being outside wandering the streets of Berlin this is a very much welcomed drink to help warm your hands and your tummy! My Warm Winter Glühwein uses a white wine base and infused with aromatics that add incredible flavor and fabulous notes of the wintry holidays. I love having a pot of this on the stove as company arrives—it is a fabulous drink to serve as a welcome, but also makes the house smell so wonderful! From my kitchen to yours – Happy Holidays! Start by inserting the whole cloves into the pieces of orange peels. Next, in a medium sauce pan set over medium heat, add the wine, honey, star anise, ginger, cinnamon sticks, and the orange peels dotted with cloves. Allow to come to a simmer, reduce the heat to low, cover and barely simmer for 30 minutes. Using a slotted spoon, remove all of the dried spices and orange peels. Set aside to use as garnishes. Lastly, stir in the sparkling water, dark rum, and orange liqueur. Gently reheat and serve warm. Tip: I found that adding in sparkling water at the end gave this warm cocktail a slightly effervescent finish and lighter texture. Idea: You can also make this in advance by following steps 1,2, and 3. If you plan to serve it later that day, just leave it to cool on the stove top. Before serving, gently reheat over medium heat, and add the sparkling water, rum, and orange liqueur. If you want to make it and store it, allow it to cool completely, transfer it into a container, and refrigerate for up to 1 week. Before serving, gently reheat over medium heat, and add the sparkling water, rum, and orange liqueur. Much of my inspiration comes from specialty food and grocery stores in my neighborhood. In just a seven block area there are a number of major brand grocery stores as well as a handful of smaller shops and markets, fine-foods stores, and the ultimate food haven: Eataly! With all of these options right near to me I tend to use them directly for inspiration. I pop in and out of stores, take photos of what inspires me, take notes in a small notebook I carry in my bag, and even taste-test things that really look delicious. After my adventures of the day, I either head back to my kitchen and start recipe testing ideas that came to me as inspiration from earlier in the day, or catalog them with a printed photo and my notes to pick up another day. I keep a pretty well-stocked pantry at home, a bit overflowing with “high and low” ingredients—they are from specialty foods stores (the “high”), and everyday ingredients from my regular grocery stores (the “low”). This combination not only makes recipe testing easier as I have a plethora of ingredients at my fingertips, but also more creative as there are more flavors to combine and pair together. A staple in my pantry are flavored oils—some are homemade and some are store-bought. I love using a basil olive oil drizzled on tomatoes, or a truffle olive oil on roasted potatoes, and my Lemon & Thyme Oil on just about anything! You can serve this oil with big chunks of crusty bread with drinks or during dinner. Drizzle it on a bed or arugula with crushed Pistachios, or on pasta with freshly-grated Parmesan cheese. For fun, I have also included some “extras”—my Orange & Honey Oil and my Shallot & Black Pepper Oil. All three flavored oils can be used in so many ways, so have fun experimenting! In a small sauce pan set over medium heat, add all of the ingredients. Allow the oil to come to a simmer, then lower the heat to low and cook for 3 minutes. Remove from the heat, transfer into a small glass bowl, and allow to cool completely at room temperature. Store in an air tight container for up to 5 days in the refrigerator. In a small sauce pan set over medium heat, add the olive oil and orange peel. Remove from the heat and stir in the honey. Transfer into a small glass bowl, and allow to cool completely to room temperature. Tip: I like to make flavored oils in small batches to ensure they stay as fresh and flavorful as possible. These oils can be stored in an air tight container for up to 5 days in the refrigerator. Gently reheat the oil in a small saucepan set oven low heat until the oil liquifies again. You can either serve the oil warm or at room temperature. You can easily expand this recipe by two or three times for larger quantities. A well thought out menu can really make a soirée seem effortless, regardless of the time of day, theme, or occasion. Instead of trying o make everything yourself (there is really no “knead” to make homemade baguettes! ), I think a smart host/ess should always have a few tried-and-true store-bought secrets up their sleeve and at the ready. I rely on few favorite brands that I have tested and know how to work with as ready-made components to enhance my menus and cut preparation time to a much more manageable proportion of my overall prep time. With certain useful combos, and easy and elegant recipes, I make my guests feel welcomed, special, and most importantly I get to enjoy my own party without being on constant catering duty. I keep flowers simple, the music light and airy, and set the table the night before. For Easter, I love hosting a casual brunch filled with some homemade things, some store-bought things, and some easily-assembled things. This year, Ryan and I will be spending Easter with his parent’s on their farm. Rather than have a complicated and labor-intensive menu, we decided a brunch would be an easier idea. Because the farm isn’t surrounded by big grocery stores and specialty food markets, I wanted to plan a menu that included things that were easy to make, had that WOW! factor, and could easily be transported from Chicago to Iowa. Whether you celebrate Easter or not, I hope my brunch menu inspires you to host a wonderful soirée (with lots of bubbly!) filled with family and friends! Happy Easter! The dried spice blend Herbes de Provence is such a fabulous ingredient to have on hand! This South of France signature seasoning is a blend of aromatic spices such as lavender, basil, rosemary, thyme, oregano, tarragon, parsley, fennel seed, marjoram, and sage. Traditionally, it is used to flavor meats, poultry, and vegetables, however, I have used it in soups, breads, and now as the star (yet unexpected!) ingredient in my Herbes de Provence Chocolate Truffles! I just love how the savory blend of herbs compliments the intensity of the dark chocolate and natural sweetness of the heavy cream – a match made in confectionary heaven! Serve these sophisticated chocolates with a bold red wine, very dry Champagne, or alongside a cheese plate for an exciting twist! In a small sauce pan set over medium heat, add the heavy cream and Herbes de Provence. Bring to just under the boiling point, then turn off the heat and allow to steep for 5 minutes. Meanwhile, place the chopped chocolate and butter into a large glass bowl. Set aside. Bring the heavy cream infusion back up to just under the boiling point. Using a fine mesh sieve strain the mixture over the chocolate, pressing down on the herbs with a wooden spoon making sure to extract all of the cream. Stir until completely smooth. This creates the ganache base. Place the ganache into the refrigerator to firm up, about 2 hours. Place the cocoa powder into a shallow bowl. Using a 1-inch scoop or tablespoon, scoop out balls of ganache and place onto a sheet pan lined with parchment paper. After you have scooped all the ganache, roll each one by hand into a ball and then roll each truffle through the cocoa powder to coat. Arrange on a serving platter, or place into an airtight container. Truffles can be stored for up to 4 days in the refrigerator. It is no secret I love to entertain at home! From menu planning, to setting the table, or spending time in my kitchen, I will find any excuse to throw a soirée! While I certainly have a few tricks up my sleeve to ensure my guests are always having a fabulous time, my #1 tip is to never make everything yourself. I like to choose two or three different dishes to prepare, then rely on favorite store-bought brands, bakeries, and gourmet markets to round out my menu. It’s the simplest way to ensure that I have fun at my own parties! They say the dessert is what people always remember from any party. A really good dessert is always something I like to pay special attention to. Whether I am making it myself or heading to one of my neighborhood bakeries, I make sure to always have something that will WOW! everyone – myself included! That is exactly what my Sparking Raspberry Sorbet will do at your next party—it will bring that perfect WOW! factor. This particular dessert relies on simple components; really good Champagne, really good store-bought Raspberry Sorbet, and the most flavorful homemade Four Berry Sauce. Besides being a perfectly elegant dessert for any occasion, it is one of the easiest desserts to assemble. Once you make the Four Berry Sauce (which uses frozen berries and can be stored in the refrigerator), it all comes together in just a few minutes! I love to serve this in a small coupe, small bowl, or even in a martini glass. Bottoms (and spoons!) up! In a small saucepan set over medium heat, add the frozen berries, preserves, liqueur, and lemon zest. Cook for 10-15 minutes, until the berries have released their juices and are very tender, stirring occasionally. Remove from heat. Place a fine mesh sieve over a glass bowl. Transfer the mixture into the sieve. Using the back of a wooden spoon press the mixture through the sieve. Cover tightly with plastic wrap and refrigerate until chilled. To Serve: Layer this luscious berry sauce in a small coupe with a single scoop of raspberry sorbet and ¼ cup of very dry, chilled Champagne. It is a perfect dessert for a grown-up celebration, very elegant presentation, and just an all around fabulous surprise for your guests. Tip: If you don’t have raspberry preserves, you can substitute strawberry, blueberry, or blackberry. The pectin in the preserves is what will thicken the berry sauce slightly.